There is a great news for all Samsung Galaxy Note 2 users including myself. Samsung has revealed Android 5.0 Lollipop update is coming for Note 2. The information is available from the Finnish website of Samsung and they have clearly mentioned that Android Lollipop update will be rolling out for Note 2, Note 3 and Note 4. Till now, we have always seen that Samsung devices which have become more than 2 years older are not guaranteed with more than 2 major updates. So at first there was a phase of confusion is they mentioned Note by mistake. I have provided the English translated version of the Finnish page in the screenshot so that it becomes easier for readers to know. The Finnish site has clearly mentioned the available Android updates for the two variants of Note 2. Android 5.0 lollipop update is giant leap from what it was in the previous versions. Android Lollipop has brought huge improvements in terms of the user interface owing to the implementation of the latest Material Design technology. We are still not sure for which locations will be receiving the updates but as soon as we get more details we’ll update you. I am really waiting for that Android Lollipop version. I have read the new features and I am so really excited to try it. hai guys! 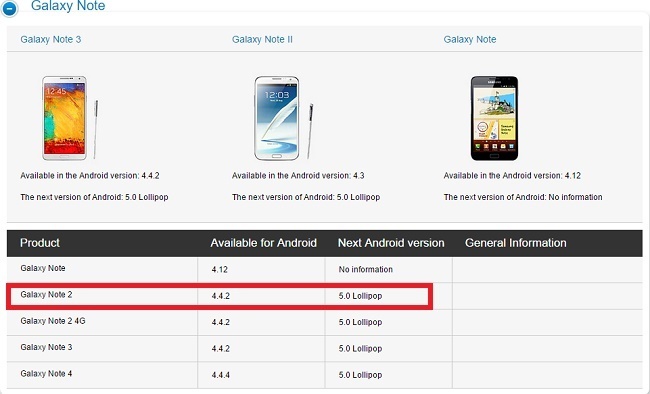 This is very very good news for galaxy users.. now we can use android 5.0 lollipop in galaxy note 2.. i am very excited.